Greece and the surrounding regions are well-known for one dessert item in particular: baklava. In fact, if someone were to ask you to name a Greek dessert, I’m willing to bet that baklava would probably be the first, and the last that would come to mind. 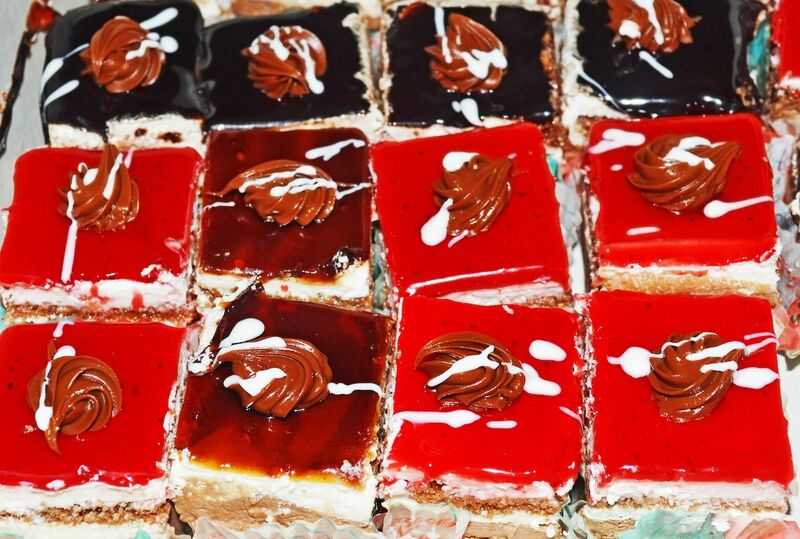 Despite it being the most well-known dessert from Greece, it’s not widely consumed by Greeks in comparison to how often these ten sweet treats find a place at the table. Here’s all the delicious Greek desserts you’re missing out on that you need to try, whether it’s on the islands themselves, or at your local Greek deli. 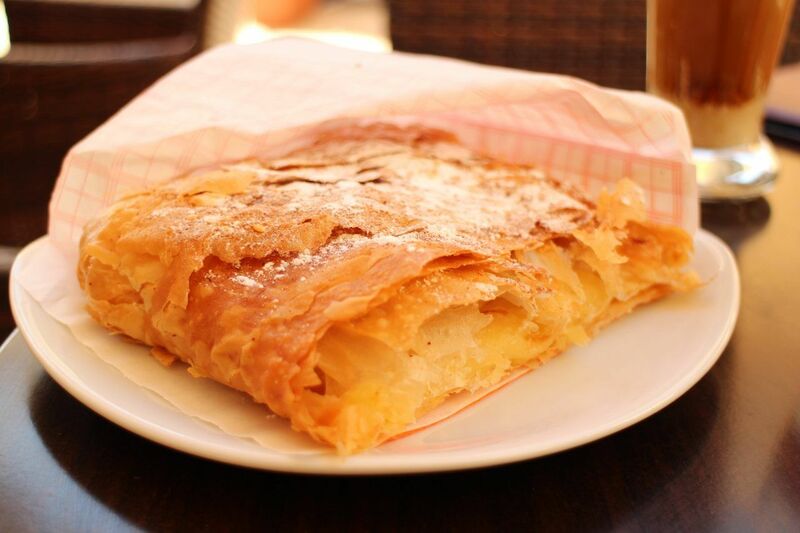 The name of this popular Greek dessert essentially translates to “milk börek.” Popular throughout the Balkans, börek is a pastry which is traditionally stuffed with savory fillings such as cheese or spinach. 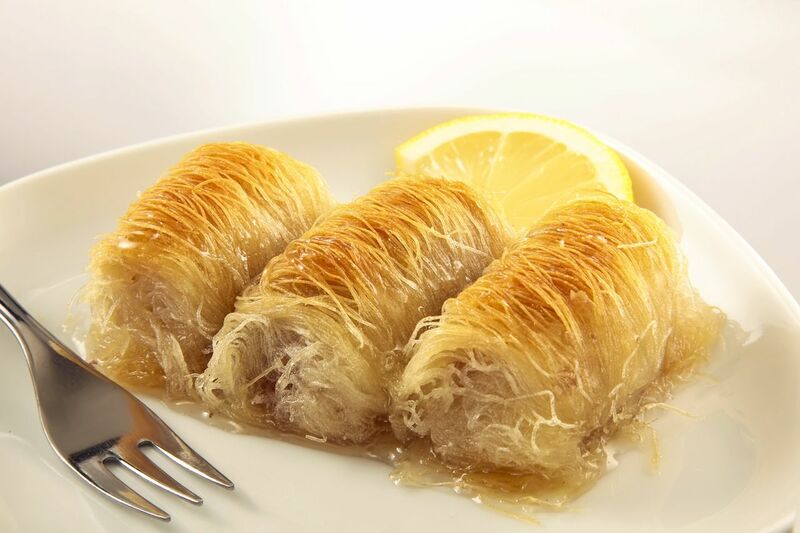 The Greek version most likely spread throughout the region during the period of the Ottoman empire and instead of being a savory snack we transformed it into a dessert. We took the phyllo pastry and folded it over a rich, creamy semolina custard filling. Soft and sugary on the inside and cased in crisp buttery pastry, this dessert is an outstanding invention, if we do say so ourselves. 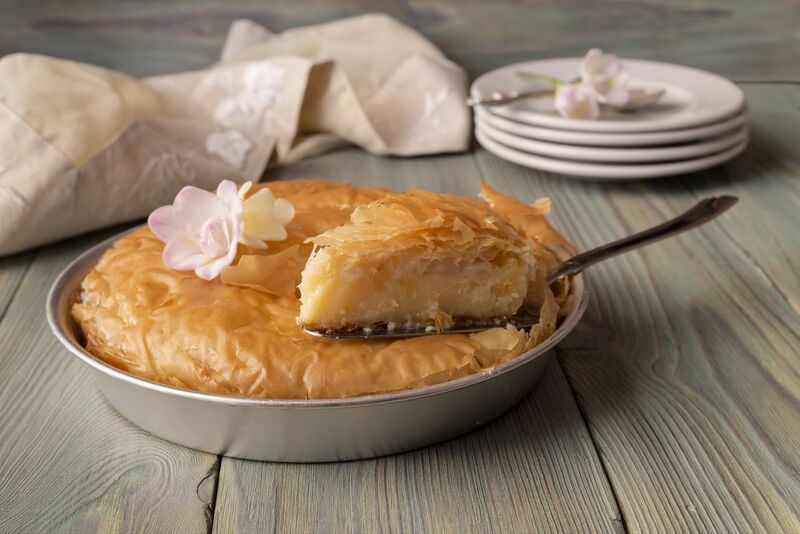 Kataifi is also made with phyllo pastry, but in this recipe the phyllo is shredded, giving the dessert a different texture and a similar appearance of galaktoboureko or baklava, both of which are made with the same type of pastry. Depending on the region of Greece, the shredded phyllo is wrapped around a sweet filling of chopped nuts, usually walnuts, almonds, or pistachios. Kataifi is then soaked in a sugary syrup which is commonly infused with ground clove and cinnamon. A perfect accompaniment to a cup of coffee. Melοmakaronas are cookies traditionally made and enjoyed during Christmas time, but you can find them in Greek bakeries throughout the year as well. The aromatic treats are made with flour and semolina which is spiced with cloves, cinnamon, and orange zest. They are then soaked in a sticky syrup, and topped with chopped walnuts. They truly taste like Christmas in every bite. 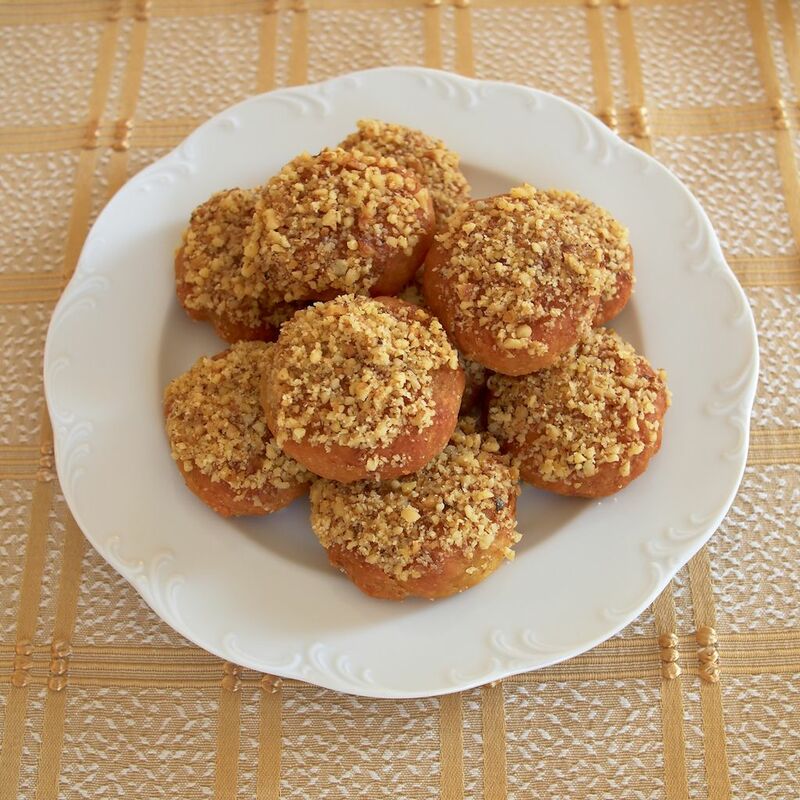 These are another type of cookie commonly made at Christmas time, but again, kourabiedes can also be found year-round in Greece. They are buttery, shortbread cookies made with local almonds and dusted with icing sugar. 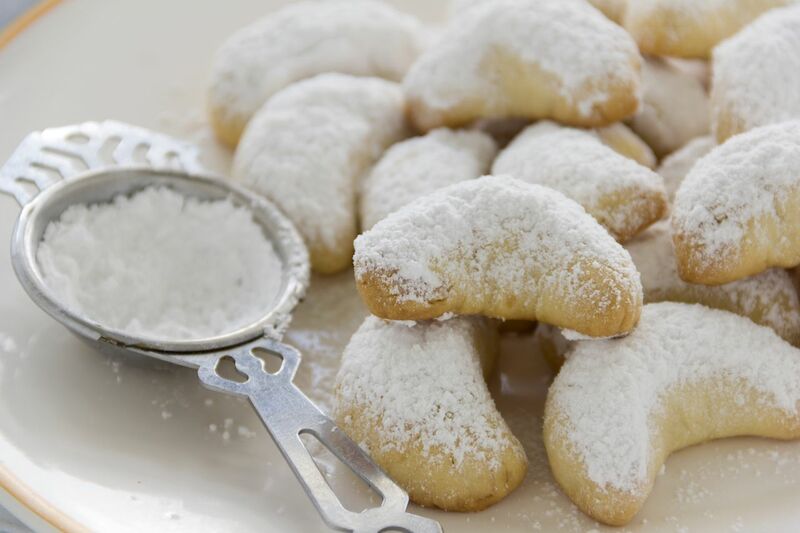 Kourabiedes are often compared to wedding cookies, although the use of whole almonds sets them apart from versions found in Mexico, Italy, Russia, and elsewhere. There are actually two types of halva found in Greece. The first is a dense, dry sweet made with tahini and is popular throughout the Middle East, North Africa, and parts of Asia. 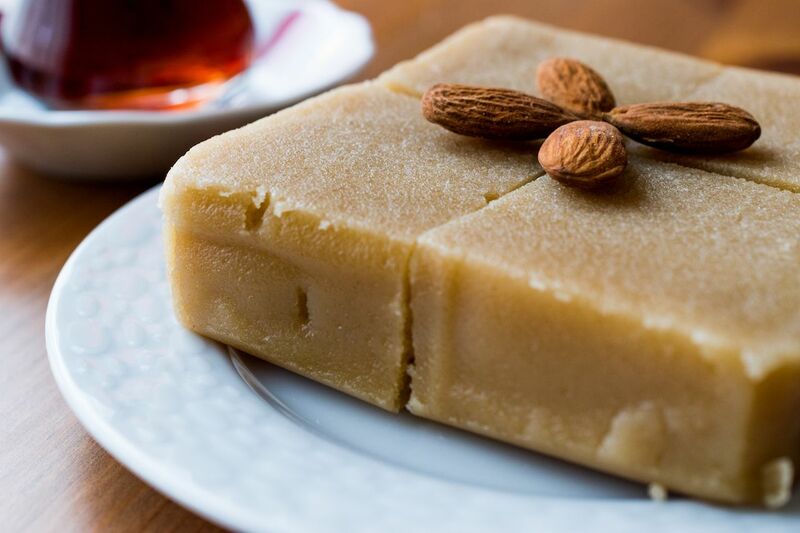 The second type of halva, pictured here, is a soft no-bake cake made with semolina and soaked in a syrup typically infused with cinnamon and clove. Loukoumades are our version of doughnuts. They are very similar in shape and consistency to doughnut holes in the US. 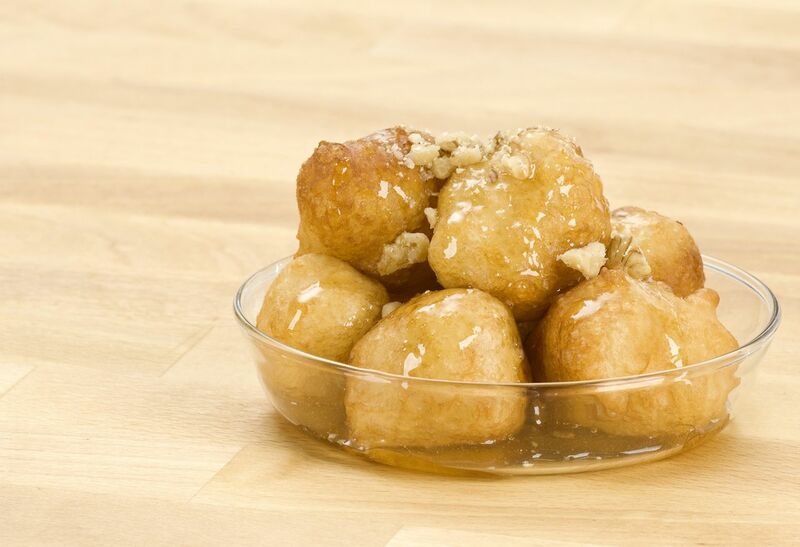 The deep-fried dough balls are usually soaked in honey syrup and are often covered in chopped walnuts or drizzled with chocolate. Loukoumades can almost always be found at local fairs, festivals, and even concerts. While the origin of loukoumades is greatly debated (like most foods from this region of the world), some claim that these treats were awarded to the winners of the first-ever Greek Olympic games in 776 BC. This Greek pastry is actually typically enjoyed at breakfast time. You’ll find a variety of fillings to choose from in a local Greek bakery such as cheese, minced meat, or a sweet semolina custard. The sweetened version is usually sprinkled with cinnamon and icing sugar. While this treat makes for a delicious breakfast paired with thick Greek coffee, it’s equally delightful when eaten as dessert. 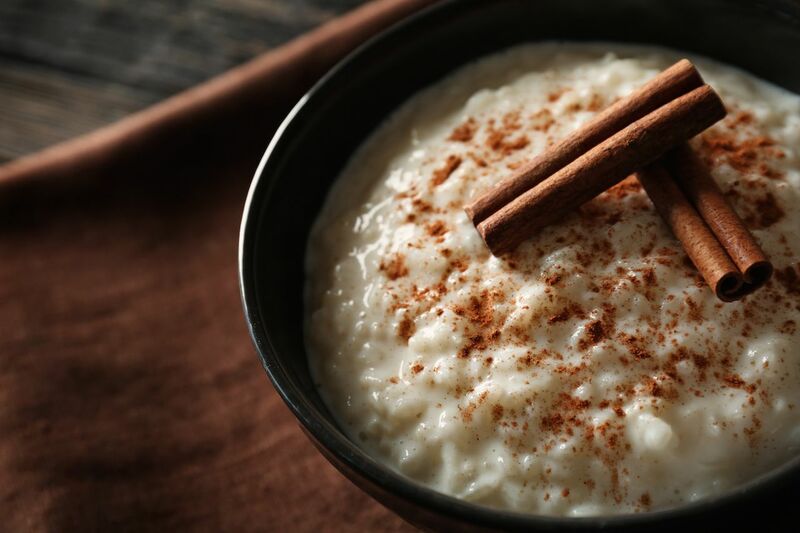 You’ve probably seen this dessert all around the world, especially in Latin America where it’s known as “arroz con leche.” Rizogalo, or “rice milk,” is known as Greek rice pudding. This thick, creamy treat is topped with cinnamon and is usually served cold. 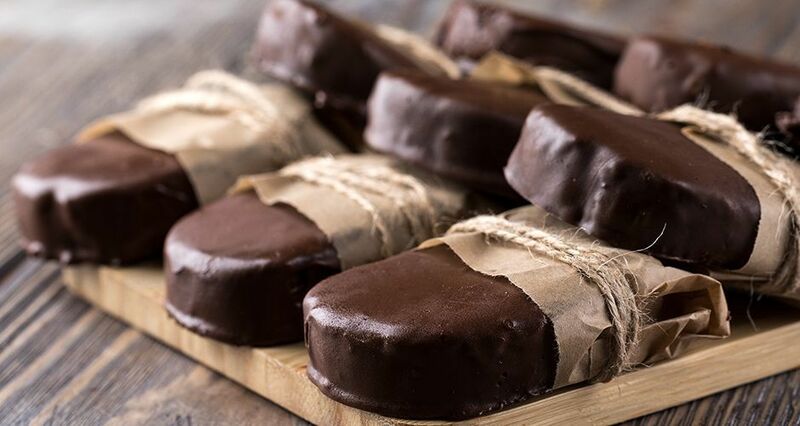 These chocolates are another treat found in the Greek sweet shops (zaharoplasteia), and are again a common gift given during the practice of filoksenia. Kariokes are chocolate and walnut-filled cookies dipped in even melted chocolate. They are individually wrapped and make a perfect gift and delicious dessert. Find a smashing recipe for kariokes here.